"It sure is nice when one of my inventions actually works!" So says Wheeljack...And that's about sums up everything you need to know about him. Wheeljack is his own worst enemy. Something of a crackpot inventor, a good half of his creations blow up in his face, and that's just if he's lucky. He's simultaneously one of the Autobots' greatest assets and problems; for every successful gadget he builds, there's one which requires Ratchet or Hoist to put him (and his lab) back together. But once in a while he strikes gold, which has won him respect from even the Decepticons. He is, however, not a complete nerd. As good as he is in the lab, Wheeljack is just as amazing on the road: there are few stunts he can't pull off, and he loves to show off his driving skills as much as he does his inventions. He is, however, a little less confident when it comes to flying, which he accomplishes using solid-fuel rocket jets in his forearms. And yep! That about sums it up for him and this is whether he is in the comics or cartoons. As the first ever, yep, read my lips, the first EVER Transformers to appear in the cartoons, Wheeljackie always have a special place in my heart. When he first appeared on Cybertron looking for any excess energy left, he transformed into a blocky hovercar with wings. After eons and eons on earth before waking up, Wheeljack have always served as the Autobots residential mechanical engineer. 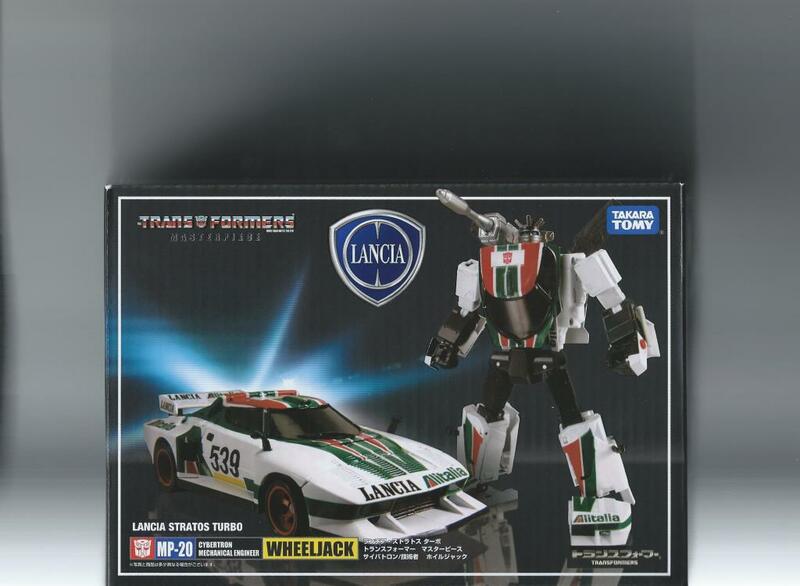 After waking up and given the alternate form of the Lancia Stratos Turbo racing car, Wheeljack mechanical genius was even more supreme! Now, add in a slight bit of the mad scientist, you got a guy who has the brains...or the circuit to invent just about anything and everything. Everything from a remote control to go against an antimatter powered Megatron to fixing up a badly damaged Optimus Prime, you name it, he got it! Order to build some mechanical dinosaurs? Yep, Wheeljack is there to lead, need some device to break the hypo-chip? Yep, call up Jackie. However, despite all of his inventions, many either did not work or even worked, promptly got stolen by the Decepticons. Sadly, eventually, he got complimented, then supplemented, then completely replaced by Perceptor. 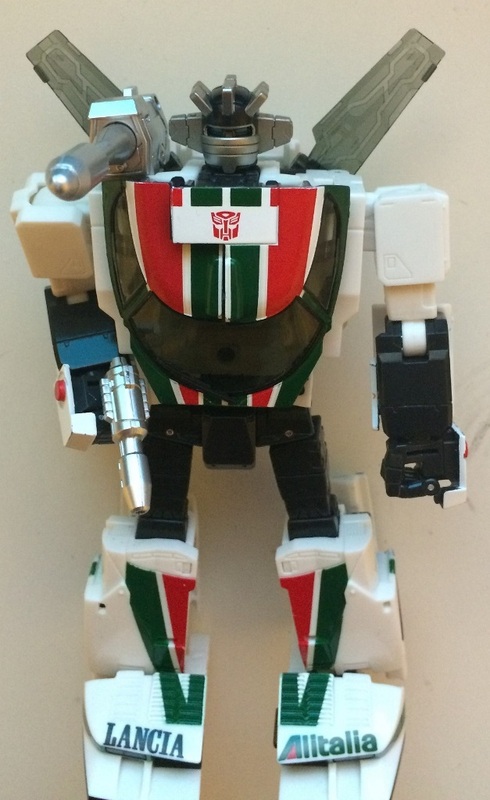 During the "Great Toy Wipe Out" of 1986 (Read the Movie), it was decided Wheeljack jig was up. He was unceremoniously disposed off by becoming just another dead body for Arcee to place alongside Windcharger during the Battle of Autobot City...A pure sad end to a major character during the first two years of the cartoon run....Along with plenty of others, including Optimus. So, as the first Transformers to ever appear in the cartoons, I just have to go out and get this Masterpiece. Well, was it worth some 70 bucks+shipping and handling = $84? Well, lets find out. Well, lets just say this. At least with these smaller MP series, Takara did not go all hog wild with the "Masterpiece packaging, or how Takara is ripping you off" thing. AKA, no super huge box that's 80% air, 20% content. The package is quite small and quite tight. 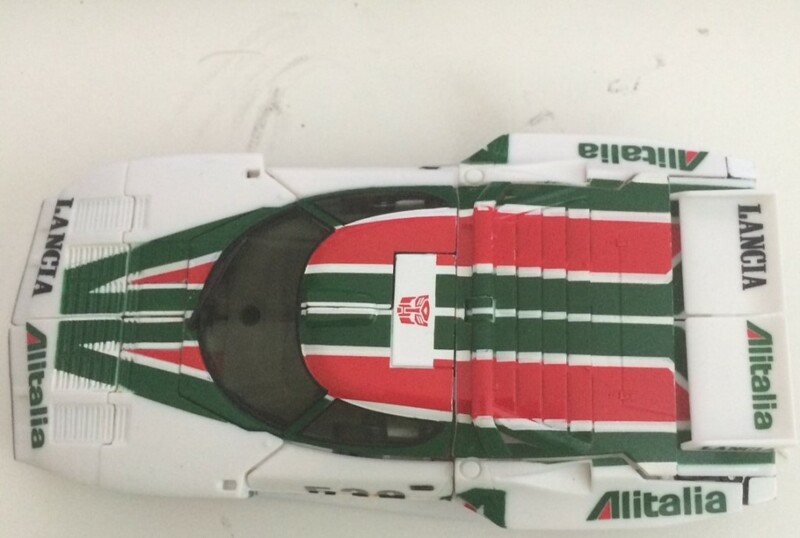 Wheeljack is in his car mode to save space, with his shoulder cannon and pistol taking up the rest. However, it is light. As in there is no weight at all. This is quite disappointing when you paid over $80 for the whole package here. But overall, the packaging deserve some mention since this is no nonsense this is what you get deal and is A LOT better than the "80% air, 20% content" thing for the big MP ones. If you are looking for accessories, you will be left disappointed. Regular MP-20 only comes with the laser pistol and the shoulder mounted energy cannon. However, in order to comply with toy safety laws these days, the energy cannon, the barrel part, although separate from the housing, can not be "fired" since the spring is missing. Now the pistol can be inserted into the bottom rear of the vehicle in alternate mode as the exhaust pipe and the cannon can be inserted onto the roof for combat mode. Other than that.....That's about it for accessories. 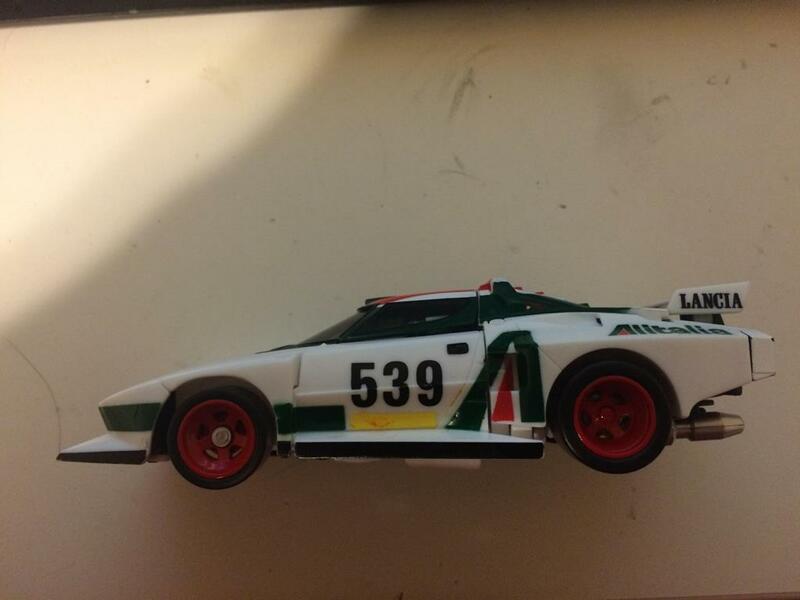 As stated, Wheelie...errr.....yeah Wheels (First he was known as wheelie until you know who showed up, so he's just "Wheels" from then on) transforms into a Lancia Stratos Turbo racing car. Now, unlike the original G1 toy, this time around, care and effort was given so the vehicle is as close to the original as possible. Overall, in Alternate mode, Wheels oozes detail and looks quite like a model of the real thing, except break lines and "cockpit" details are missing (as expected, robot kibbles are in there instead). Despite the fact that these things are much smaller than the bigger MP's and though bigger than the original toys, there still not much room to work with. For the fact that in vehicle mode, Wheels look almost like a model of a Lancia is quite the achievement and kuddles should be given to Takara for it too! Score: 9.5 Absolutely great looking in vehicle mode. Almost like a model of the Lancia! Yeah, if you are a fan...You know what Wheels looks like right? This is another reason how Wheels got to me as a kid. As a kid, I always thought his "ears" was kinda cute. The fact he "talks" with those ears (you know what I'm talking about) was the extra icing on the cake! For me, wheels was this loving, cute, and ohh so huggable mad scientist dude that whenever he talks, "flashes" his ears. I always wanted him as a kid but alas, nope. Never was able to get him. Now many moons later, how does MP-20 compare? Let's find out. After a somewhat complex transformation, well hey, this is a MP collectable, it won't be a MP if the transformation isn't convoluted. Wheel's transformation is much more involving than his G1 toy counterpart, what with the entire arms and shoulder hidden in the rear compartments. Head hidden inside the cockpit and the front the legs. The hip is also designed to swing 180 degrees forward so read the instructions carefully before begin. Also, be noted to swing the head out early. Once the shoulders are locked into the cockpit, you can not open the cockpit roof so don't bother. And speaking of that locking part. Getting the shoulders locked up the first time take some careful consideration cause it seems if you poke at it too hard, the whole thing collapses. This is because there are no metal, unless you count the hinge pins, in Wheels at all! This is serious off putting since that hip...I'm thinking swing that hip around too many times....On top of that, the locking pins goes into the rear view mirror holes! Yeah, leave off those mirrors unless you got a dire wish to feed the "carpet monster!" Anyways, Wheels looks GOOD! They finally got the proportions right. As you may know, the G1 toys features a Frankenstein with really long arms and unlocked wrists. He is also full of articulation. Heads swings, shoulders, arms, wrists, hip all can be moved and posed. Detail fidelity is again, top notch. As mentioned in the cassete-ta-cons reviews, Takara must have used slide-mould technology. There is no other way to get this kind of detail fidelity. Also, it seems like not only did Takara got the Lancia license, but also a certain airline as well (hehehehe. All those G1's with the Alltaillia stickers). This makes it even more accurate. Score: 9.8 Almost an exact representation of the cartoon original. Durability: 7.5. Well, Wheels is pretty tough. Still though, not one ounce of metal may mean trouble down the line. Especially that hip since the transformation requires you to flip it 180 degrees. Fun: 9. This figure is meant to be played with, unlike some so have fun! Price: 4. Brought down by the expensive price. Yes, as Knight, Skyquake and me discussed it. Yes, you can buy this directly from the source (read, Japan) for like $20-$30 cheaper, however, good luck on the wait if yours gets stuck in custom! The way I viewed it, I paid extra in order to get it on time, on schedule! So, it's up to you. Overall: 9.0. The only thing that brought it down was the price. But again, take your pick. Pay for $50, which is reasonable for the figure but run the risk of getting it stuck in custom or pay an extra $20 to get it on time and on schedule. The choice is up to yours. But if you are a Trans Fan, this is a good figure to get!